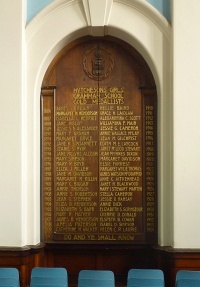 Honeyman, Keppie & Mackintosh designed a simple wooden, wall-mounted medallists' board with carved lettering which was installed in the school's then premises at 14 Elgin Street (designed by John Honeyman as the Gorbals Youth School in 1868; demolished). In 1906 the school relocated to 44 Kingarth Street. Additional boards have been added subsequently. Authorship: The style of the lettering is distinctively Mackintosh's, and the job-book entry is entirely in his hand.